The DIDO Tourney is a 'Drop in Drop out' tournament that runs on a daily basis in the Daily MPs room for nearly 24 hours from 7.01 am GMT till 6.49 am GMT, but at a time to suit you and partner and NOT at a fixed time. The Dido Tourney allows all members, where ever they live, to take part in a pseudo movement tourney which more realistically approaches a real life tournament at any time convenient to them. One can play just 4 boards at a time as the Dido Tourney is truly Drop-in, Drop-out. Also one can play with different partners at different times. PLEASE NOTE: If you start a round of 4 boards in DIDO, you are committed to complete those four boards, and you should allow for at least 30 minutes before starting the round, even though the average duration of a DIDO round is about 22 minutes. 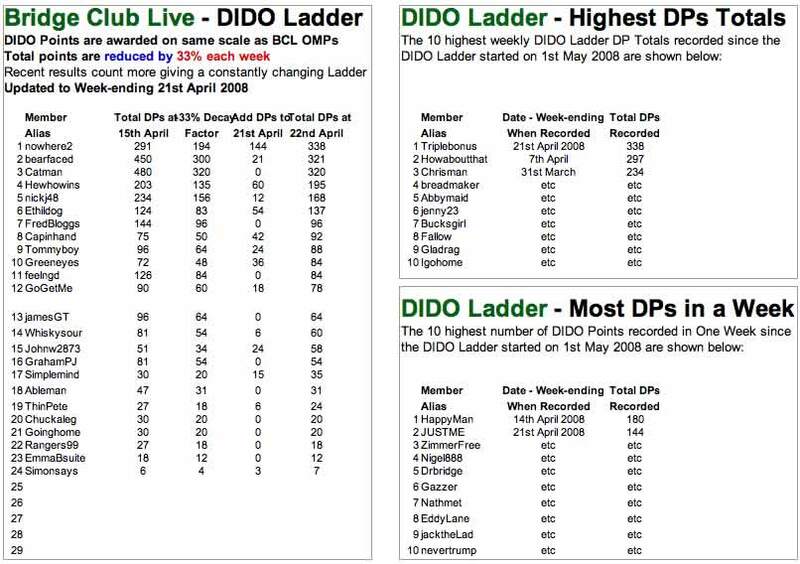 In addition to awarding Master Points for EBU members (as described elsewhere), we run a ladder for all those who score well in any number of DIDO events. We award DIDO Points for those finishing in the top quarter of the ranking list for each event. The ladder is updated weekly and accumulates all DIDO Points earned using a decaying function so that the most recent points count the most. Details and examples follow at the foot of this page. The ladder allows new players to gain a place on and ascend the ladder while relegating previous high scorers who reduce the rate at which they gain DIDO Points. A member enters that Daily MPs Room and is offered the choice of Normal Table or DIDO Tourney Table. It is normal to choose the DIDO Tourney Table option. The Normal Table option is usually chosen only for pre-arranged Pairs matches and then usually only for special competitions such as the Timber Knockout. By choosing DIDO Tourney Table, the member will be able to play as many DIDO Tourney sessions as he likes during the course of a deal with the same or many different partners but he will never play more than 4 boards (except if a crash occurs on the first board) against any other member during the same deal. Those members who have arranged to play with a particular partner will enter the room and anchor their partner by using 'Set as Partner', whereas those members without a prearranged partner will need to use 'Find a Partner' and/or 'Invite a Partner' before applying 'Set as Partner' to the partner that they've teamed up with. Any member who plays 16 or more boards (minimum of 4 x 4-board sessions) in the DIDO Tourney during the course of a deal will qualify for the DIDO Tourney Leader Board. Scoring of all boards will be across the whole field in the Daily MPs Room ensuring meaningful scores for the DIDO Tourney. Obviously no member will be able to play a board twice, nor be able to play a board that he has kibbed. The top quarter of the DIDO Tourney Leader Board will be awarded DPs on the same scale as BCL issue OMPs in other movement events. Those members who qualify to receive master points through their National Bridge Organisation will receive them where appropriate in the normal way. Any member who plays 16 or more boards (minimum of 4 x 4-board sessions) in the DIDO Tourney during the course of a deal will qualify for the DIDO Tourney Leader Board. Scoring of all boards will be across the whole field in the Daily MPs Room ensuring meaningful scores for the DIDO Tourney. During December 2014 we will be changing the DIDO Leader Board ranking by calculating it using the Square Root Formula developed by our former CTD, John Probst, which positively encourages members to continue playing above the qualifying number of boards (currently 16 and no plans to change) by taking into account the actual number of boards a member has played. 50% + ((Score – 50%) x sqrt(number boards played)/4). When applied, the Square Root Formula enhances the score of a player who plays more than 16 boards and scores more than 50%. Therefore, it could be beneficial to one's position on the Leader Board to continue playing after 16 boards. It must be stressed that PPIs are not affected in any way by the use of the Square Root Formula. •	A player with a 60% score after 16 would be pipped on the Leader Board by someone who scored a raw 57.5% after playing 36 boards as the latter would have a 'Bds%' of 61.25. • A raw score of 55% achieved by a member playing 80 boards will be adjusted by the Square Root Formula to a 'Bds%' of 72.4 on the Dido Leader Board and will score many DPs. • Likewise an unhappy player with only 40% after 16 boards may wish to enhance his Leader Board ranking by continuing to play. Were he to play 60 boards and achieve an overall raw score of 54% at the end of the deal this would be enhanced to a 'Bds%' of 57.75 on the Leader Board. It should be noted that the application of the Square Root Formula makes absolutely no difference to one's PPI which continues to be calculated on a board by board basis on the raw scores achieved at the end of the deal. A DIDO Ladder will maintain a running record of DPs awarded but they will 'decay' with time. Here are some illustrative examples of the details we provide. Each week, the number of DPs accumulated in to date will be reduced by 33% and added to the number of DPs earned in the current week to make a total for that week. This process is repeated on each subsequent week. A detailed Web page will show all the DPs earned over the last 13 weeks and how they are accumulated to your current ladder position.